Last edited by Tonyleila : 10-08-12 at 08:17 PM. I play with nameplates on, and I've never seen anything like that. Are you sure it happens when all addons are disabled at the character screen? Both of your screenshots appear to have at least one addon modifying the nameplates. Is that with a 'clean' World of Warcraft folder as well? Supposedly you can't make some file substitutions for a time now but maybe there's a regression in 5.0.5? Backup any custom files and remove them, then test again, I've never seen nameplates looking like that either. Yes this last screenshot was without replacement files. I also tested on my macbook where i dont use file substitutions or addons. I've started seeing this as well, since MoP. I just chalked it up to something funky in Blizzard's code and forgot about it - the issue doesn't persist and is only a momentary annoyance. Btw there is another bug. 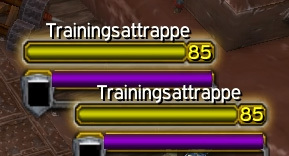 On an active nameplate (alpha = 1 on the nameplate object) it is possible to have the healthbar object with alpha 0.5. This results in the healthbar being much less visible as intended. Can only be fixed by adding a new healthbar object to the frame that is not bugged and keeping the default healthbar as value reference. Last edited by zork : 11-30-12 at 05:50 AM. is that tagged nameplate's name text region always gray? finally i create new hpBar for 'every' nameplates ,too.